1. United States Census Bureau. American Fact Finder. 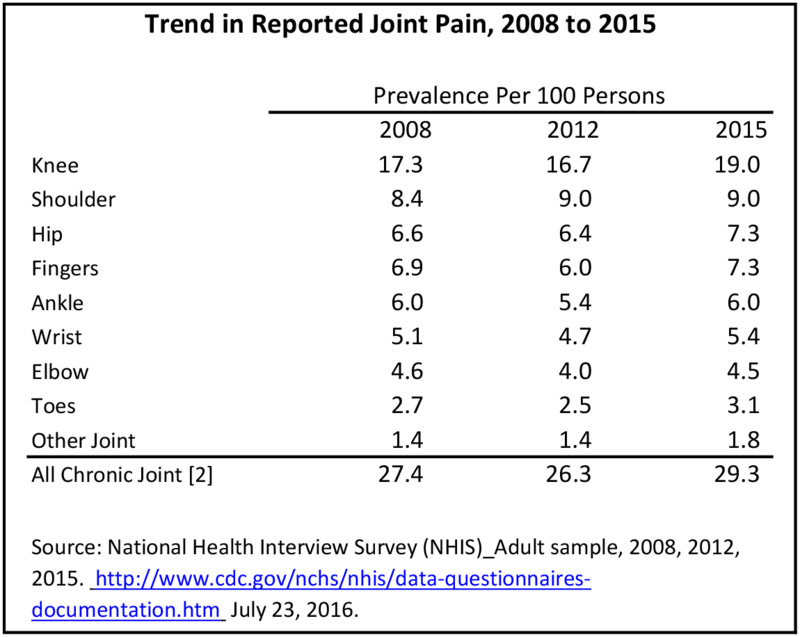 ACS Demographic and Housing Estimates: 2010-2014 American Community Survey 5-Year Estimates. https://factfinder.census.gov/faces/nav/jsf/pages/index.xhtml  Accessed August 15, 2016. 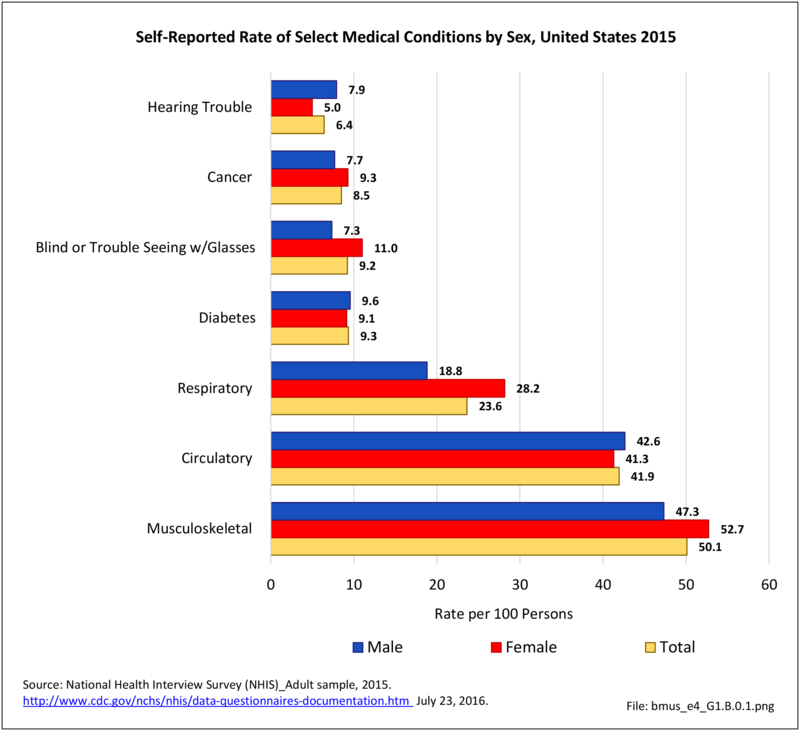 As previously noted, musculoskeletal conditions are one of the most debilitating nonfatal health diseases, leading to chronic pain and disability and reduced quality of life. The most common musculoskeletal conditions leading to disability are back and neck pain and arthritis and chronic joint pain. Back pain affects most people at some point in their lives. For the lucky, this pain has a known cause and is temporary, healing with time and rest. But for many, back pain is a constant in their life. Chronic back pain is considered to be back pain lasting three months or longer. While spinal changes that are the source of back pain may be known and understood, there remains a gap in understanding why some people are affected and others are not, and what can be done to prevent or repair damage done. In 2015, 72.3 million people age 18 and older reported they experienced chronic back pain in the previous year. This is nearly one in three adults. Of this group, more than one-third (37%) had back pain severe enough that it created radiating leg pain. Two in four (39%) also reported chronic neck pain, but 61% of the 38.9 million with neck pain had chronic neck pain alone. Back pain is reported in similar numbers in all geographic regions, with some minor differences seen. 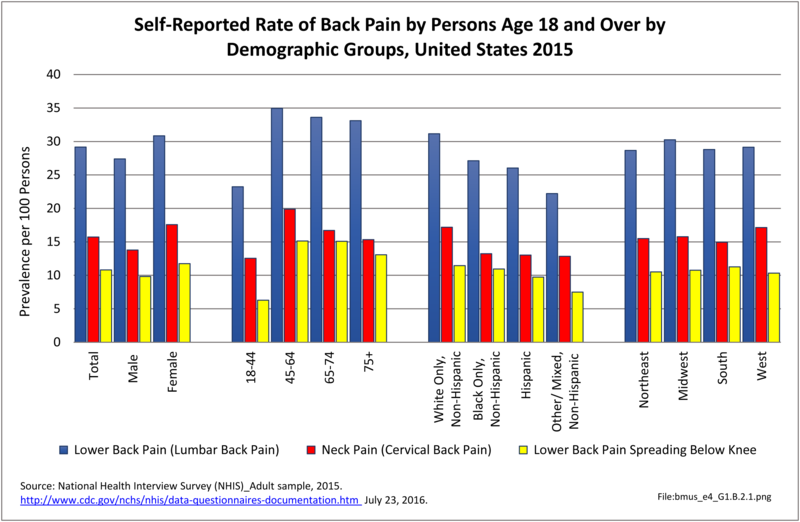 Low back pain is reported at the highest rate (30.3/100) in the Midwest, while low back pain with radiating leg pain is slightly higher in the South (11.3/100). Neck pain is reported highest in the West (17.9/100). Arthritis is associated with both chronic joint and back pain. 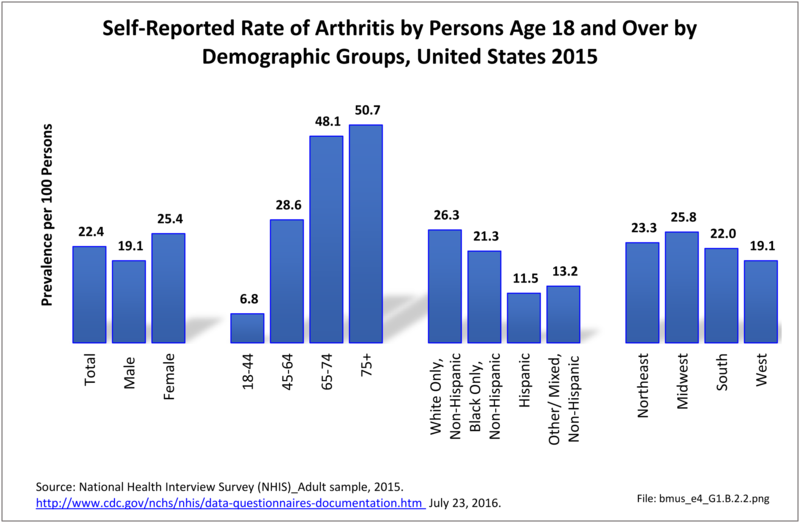 Roughly one-half of persons reporting chronic joint pain (54%), low back pain (53%), and radiating leg pain (52%) also report they have arthritis. 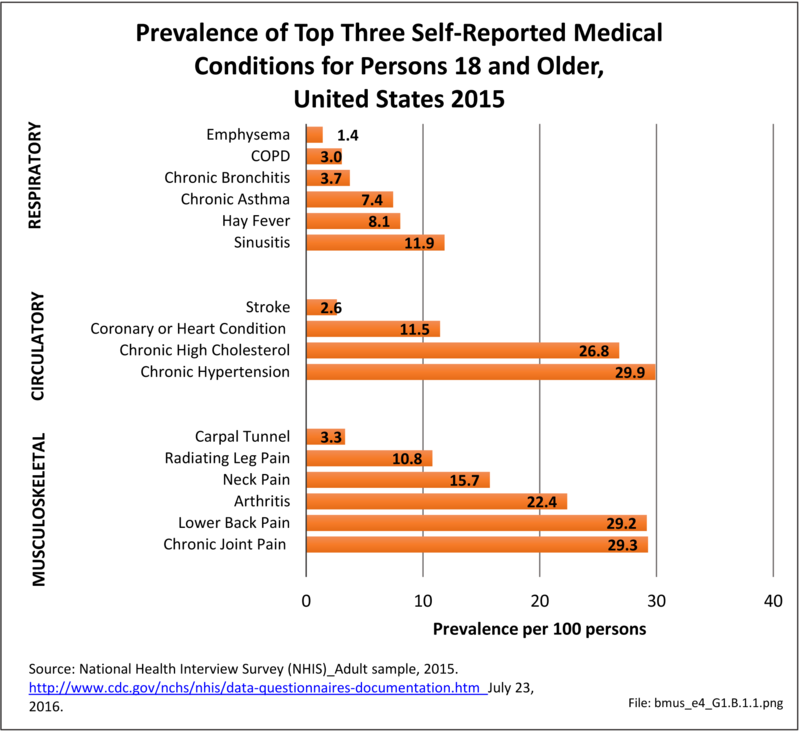 About one-third (32%) reporting neck pain report they have arthritis. Chronic knee pain is reported by all ages older than 18 years, with nearly one in three persons age 65 and older reporting chronic knee pain, and one in four (23.9/100) among those 45 to 64 years old. Because only 1 in 10 persons age 18 to 44 reports knee pain, the overall prevalence is 19 in 100. Females report a slightly higher rate of knee pain than males do. 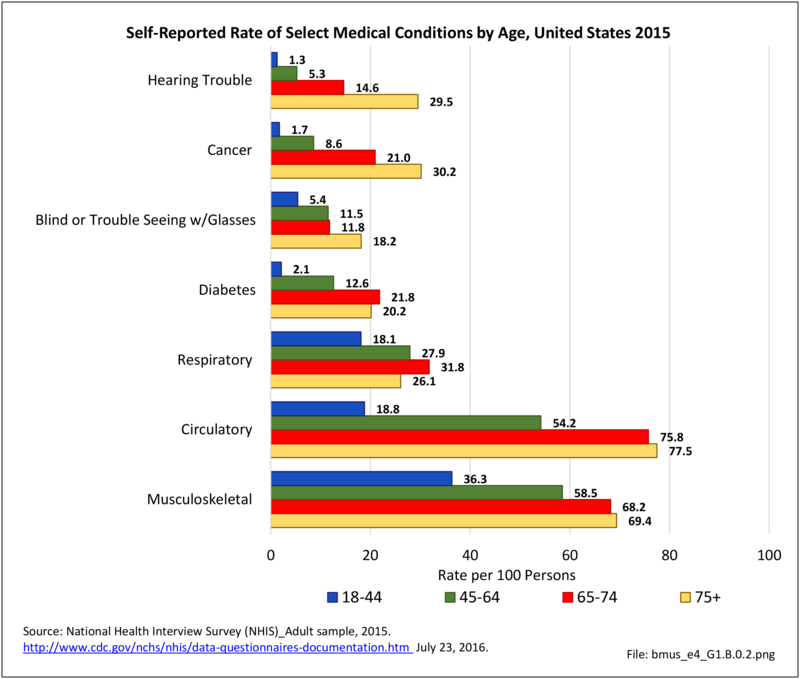 Shoulder pain, reported by 22.3 million of those age 18 and older in 2015, is the second most common joint site for chronic pain, with rates fairly equal for those age 45 and older. Shoulder pain is reported in fairly equal rates by males and females, with males having a slightly higher rate. Hip pain was reported by 18.2 million people age 18 and older in 2105. Hip pain is much more common in females than in males. As with other sites of chronic joint pain, hip pain prevalence increases with age. 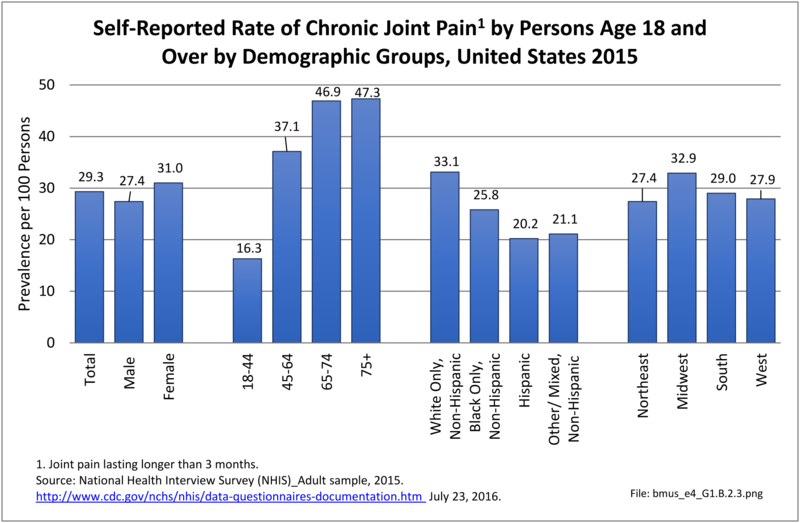 Over the past eight years, a slight increase in the prevalence rate of reported chronic joint pain has been seen. This is primarily associated with knee pain, but other joints have also seen small increases. 1. United States Census Bureau. American Fact Finder. 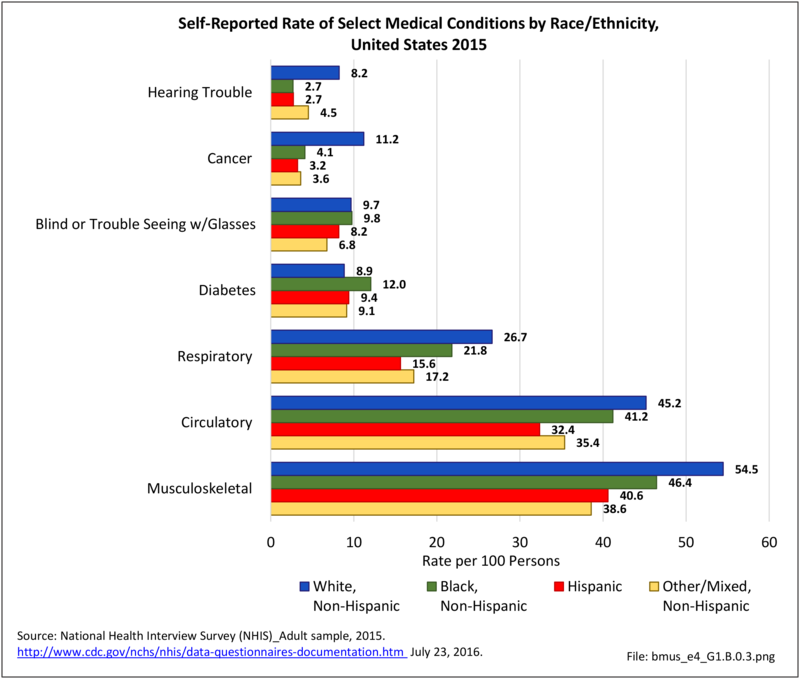 ACS DEMOGRAPHIC AND HOUSING ESTIMATES: 2010-2014 American Community Survey 5-Year Estimates. https://factfinder.census.gov/faces/nav/jsf/pages/index.xhtml. Accessed August 15, 2016.